What is the STS Campaign? We’ve worked with tenant leaders to develop the Stand for Tenant Safety (STS) campaign to help tenants in buildings dealing with disruptive renovation work and construction work (both with and without permits). 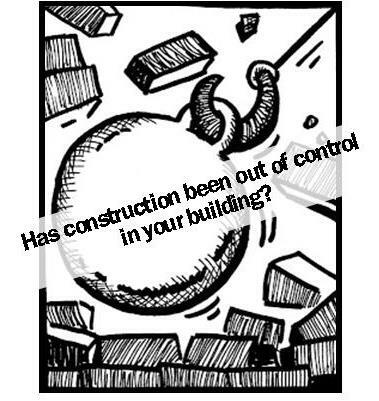 The campaign pushes for DOB reforms to safeguard tenants and prevent harassment and displacement during gut-renovation construction. We are seeking residents who have currently gone through, or have lived through disruptive renovations in their building. Nasty things happen to tenants when landlords mismanage renovations in their buildings. Demolition almost always precedes renovation, and it is during this stage that we see things like ceilings collapsing, debris scattered throughout hallways, excessive dust infiltrating tenants’ units, and poorly-maintained work sites – all of which can pose incredible threats to the health, welfare, and safety of tenants. We are working on collecting data on what tenants face during mismanaged construction so that we can create new laws and put an end to it. If this is something you have experienced, please come into the CSC office (61 E 4th St) to pick up and fill out a Real-Time Enforcement Construction survey. Tenant leaders and CSC organizers can also bring surveys to your building for you and your neighbors to fill out, or you can get help get involved with mass distribution yourself! Email Brandon for more details. See the campaign blog here. In 2013, Brandon, Yonatan, and the RTE tenant leaders began using a 17-step process of Participatory Action Research to develop a survey which is intended to collect data on the effectiveness of DOB current enforcement. RTE had two major events in 2013. On March 28th, we collaborated with CB3 to host a workshop to introduce tenants in the community to the DOB Building Info Systems website; on December 3rd, we hosted a two-part Info Session to distribute tenants rights material pertaining to construction issues and also to introduce community members to the full RTE reform agenda and the organizing associated with it. Both events had close to 40 attendees. The survey was completed in February 2014 and debuted to a meeting on February 26, 2014. 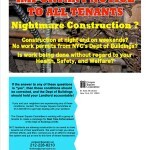 We are currently seeking as many tenants who have experienced mismanaged construction to fill it out. Come into the CSC office to pick it up.